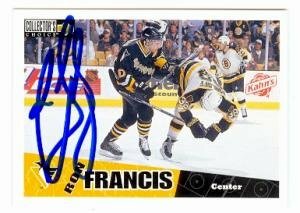 Ron Francis signed Hockey Card Pittsburgh Penguins 1996 Upper Deck 212. Item comes fully certified with a tamper-evident serialized hologram and certificate of authenticity. . Signed by - Ron Francis. Item Weight - 2 lbs. Signed by - Ron Francis. Item Weight - 2 lbs. Package Quantity: 1 Excellent Quality. Great Gift Idea.